This post explains and provide details about vSAN congestion Congestion is a flow control mechanism used by vSAN (congestion). and it occurs when the I/O rate of the lower layers of the storage subsystem fails to keep up with the I/O rate of the higher layers. Slab Congestion: This originates in vSAN internal operation slabs. It occurs when the number of inflight operations exceed the capacity of operation slabs. 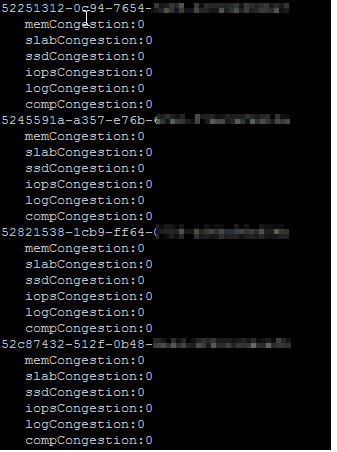 Comp Congestion: This occurs when the size of some internal table used for vSAN object components is exceeding threshold. SSD Congestion: This occurs when the cache tier disk write buffer space runs out. Log Congestion: This occurs when vSAN internal log space usage in cache tier disk runs out. Mem Congestion: This occurs when the size of used memory heap by vSAN internal components exceed the threshold. IOPS Congestion: IOPS reservations/limits can be applied to vSAN object components. If component IOPS exceed reservations and disk IOPS utilization is 100. Use the following commands under your responsability. If your vSAN report LSOM errors in vSAN logs, these metrics can be changed to reduce vSAN congestion. esxcfg-advcfg -s 16 /LSOM/lsomLogCongestionLowLimitGB – (default 8). esxcfg-advcfg -s 24 /LSOM/lsomLogCongestionHighLimitGB – (default 16). Thanks for the script – VMWare’s own KB doesn’t have any info on how to look it up, only that their technicians will have to get involved to discern the cause of it. Love this blog.